Last night at 8pm we watched six Coyotes playing in the wheat stubble behind our house, with one sitting on a rise to be lookout. We hear them many nights a week when the train goes thru and blows it's whistle, that starts a howling that lasts two to three minutes. Thanks for your Coyote report Jody, the Coyotes were likely hunting for small rodents in the stubble of the wheat! 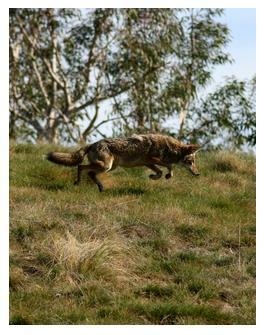 I found this picture of a hunting Coyote - did the ones you saw look like this?